Cooler Master’s range of CPU coolers have always been popular with the general PC builders. With innovation in technology, they are pushing their limits in CPU cooling performance with their new releases for 2018/2019. For a start, Cooler Master is designing their new Hyper 212 CPU Cooler. The Hyper 212 has a reputation of great performance offered at an affordable price. To further improve its heat dissipation capabilities, Cooler Master has extended the 212’s fin size, and integrated another heatpipe to the unit. This should increase the performance of the Hyper 212. However, they are currently still in the midst of finalizing the design of the cooler, and are seeking for feedback and advise from end users. It won’t probably be soon before we will see this new CPU cooler on the shelves. Secondly, they have also announced their new All-in-One Liquid Cooler. Honestly, other than having a transparent cover that allows users to see the pump within the unit, there isn’t much to say about it. This unit can also be customized with its addressable LEDs. This is why, it should be targeted more for users who are specifically looking for such niche RGB products. Lastly, Cooler Master also have announced their new Thermal Electric All-in-One Liquid Cooler. This new gets us excited, as enthusiasts will now be able to reduce the temperatures of their CPU to below room temperature. Some may wonder about condensation issues, but since the TEC cooler only chills the water to below room temperature, and then allowing the chilled water to cool the CPU, condensation will not be formed directly on the CPU block. We are sure that this solution will be a hit with enthusiasts who wishes to run their overclocked solutions 24/7, as it will give them a much stable system. Taipei, TAIWAN – Cooler Master, a leader in PC cooling solutions, will announce a concept version of the legendary Hyper 212, a new transparent all-in-one liquid cooler, and our first thermal electric all-in-one liquid cooler. The new thermal electric liquid cooler is the next stage in cooling. Never worry about overheating an overclocked system with the new thermal electric water cooler. Cooler Master is committed to creating the next great liquid or air coolers. Legends never die. Cooler Master will unveil a concept version of the Hyper 212 air cooler at COMPUTEX. The concept Hyper 212 has an extended fin size. The fin size is 25 percent more than the Hyper 212 EVO. The concept Hyper 212 has five heatpipes instead of four. Making the new concept more effective at heat dissipation than previous Hyper 212s. No more worrying if this will have enough RAM clearance. The new concept will fit any RAM configuration. New to this air cooler is a unique RGB Cooler Master logo that will sync with Cooler Master RGB Fans. 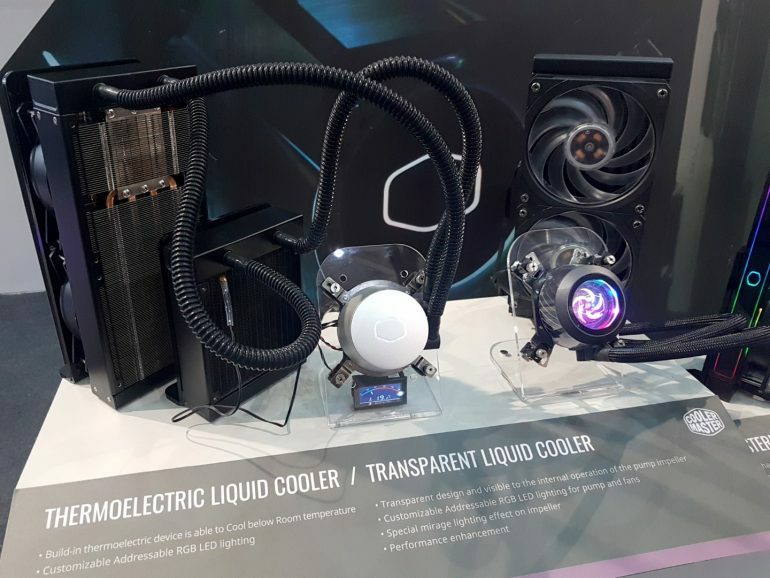 We invite Computex attendees to provide valuable feedback on this new concept cooler and working together to create the next legendary air cooler. Cooler Master is unveiling a transparent all-in-one liquid cooler. The new design increases performance and allows users to see the pump working. The Addressable RGB pump illuminates the circular pump and provides never seen before lighting effects from an AIO pump. The liquid cooler also has two MasterFan 120mm Addressable RGB fans. Choose the perfect lighting for the Cooler Master liquid cooler with the ARGB controller. Users can customize the individual LEDs with the release of the LightingControl software. At COMPUTEX, Cooler Master will unveil their first thermal electric all-in-one liquid cooler. Powered by innovation, the thermal electric cooler cools your PC components with power, converting ambient liquid into icy cold water to cool down the CPU. The pump is made from aluminum and has Addressable RGB (ARGB) lighting. Users will be able to customize the individual LEDs using the LightingControl software. The thermal electric cooler is the ideal solutions for those that want to overclock their system.